Project 1: Coordination of muscle sets during locomotion. Drosophila larvae crawl forward by producing waves of muscle contractions that travel from the back to the front of the animal. These contractions can be recorded by inserting electrodes into muscles in the abdominal wall. By inserting more than one electrode at the same time, one can monitor the activity of different muscle sets, such as those on the back (dorsal) or belly (ventral) side of the animal. I recorded from dorsal and ventral muscles in the same abdominal segment during crawling activity, and asked: How do these muscle sets coordinate their activity during crawling? Are they simultaneously active? Does one set activate before another, and if so which one? Some previous work has been done in this area, but few, if any, complete electrophysiological comparisons of muscle activity have been made. In addition, some previous studies report conflicting results as to when muscle sets activate. Understanding muscle coordination in this system is important basic science. But it will also improve our knowledge of a model system that can be used to study motor control diseases, such as Parkinson’s or Lou Gehrig’s disease (ALS). Project 2: Automated detection of bursts from electrophysiological recordings. The study of rhythmic motor behaviors, like locomotion, often involves recording from muscles or neurons whose electrical activity is organized into bursts. Calculating how long these bursts last (burst duration), or how much time elapses between them (cycle duration), helps to determine the timing of the muscle contractions underlying a given behavior (the motor pattern). Then, motor patterns can be compared across different treatment conditions, such as a change in gene expression or the application of a drug, to see how the timing changes. But before these calculations can be made, one has to be able to detect the bursts themselves. How do we determine when a burst starts? How do we determine when it ends? Our eyes are very good at doing this, but creating a program to mark those starts and stops as accurately as someone doing it by hand isn’t as easy as it sounds. For example, setting fixed thresholds doesn’t work well as baselines often shift during a recording. We’ve developed a method for automated burst detection that we hope other researchers can use. New tools for the automated detection of bursts could make data analysis more efficient and consistent, leading to advancements in the study of motor control. Project 3: Analyzing bursting while avoiding pseudoreplication. Assuming you can properly detect bursts and quantify the burst or cycle durations, another problem comes when you want to compare measurements across groups. Most studies of bursting activity pool multiple measurements across relatively few animals and perform statistical testing on these pooled data. This constitutes pseudoreplication, since multiple measures from the same animal are not independent, as required by most statistical tests. We’ve developed a method to analyze bursting data while avoiding pseudoreplication and the erroneous conclusions that can come from violating the assumptions of a statistical test. Project 4: Effects of altering motor neuron excitability on the motor pattern. Motor patterns underlying rhythmic motor behaviors like locomotion are produced by networks of neurons. Neurons within these networks send chemical signals to one another across specialized structures (synapses). Since motor neurons represent the direct connection between other neurons in the network and the muscles, an important question is, what do motor neurons do with the signals they receive? Do they simply receive input from other neurons and transmit signals to the muscles relatively unchanged? Or, do motor neurons respond to inputs in much more complex ways and ultimately shape the final timing of the motor pattern? I used genetic tools in Drosophila larvae to answer these questions. Neurons express proteins (channels) that allow charged molecules (ions) to cross the cell membrane and thereby alter the electrical activity of the cell. Changing the expression levels of these channel proteins can make neurons respond to input differently, for example, firing at lower levels of stimulation and at higher frequencies (changes in excitability). 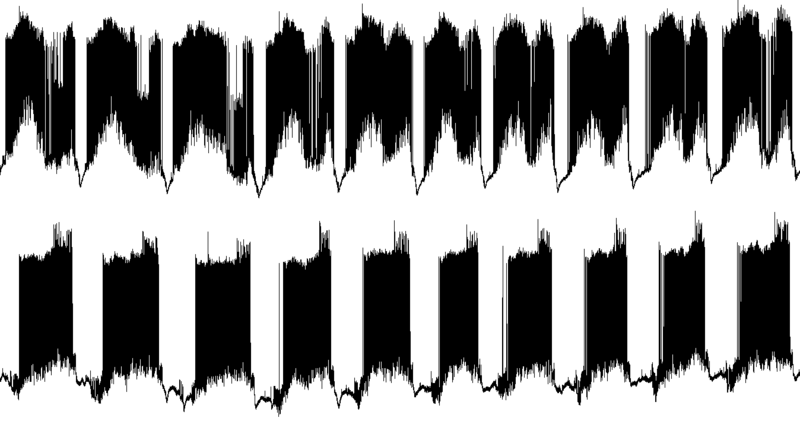 I reduced the expression of several channels, causing a change in motor neuron excitability and then recorded the motor pattern. Studies like these can help determine the role of motor neurons in shaping motor output, and identify important channel proteins. Some of these projects likely sound more exciting than others (projects 1 and 4), but others are closer to a releasable research output (project 3). Of course, there is always the option to release some of the projects in their current, fairly raw form. On one hand, it might be best to let people start mulling over the results right away. On the other hand, the work could be more useful to people if it comes with a more formal explanation. I’d love to know what people think about which project should take priority, and any questions or feedback people have on specific projects. So, please vote and leave me your comments! Update 01/14/2013: I’ve closed the poll, but please feel free to still leave me your feedback in the comments or send me an email. See the following post for the results. To know better the neurons can be a great advance. Thanks for your work. Project 1 sounded a bit vague, 2 and 3 were solid but more like housekeeping chores. Project 4 seems like the most work went into it already, in generating the ion channel mutants, and it is the most publishable, assuming you see some interesting results in the knockout flies. Good luck and keep us posted! Thanks so much for your feedback! I’ll definitely keep everyone updated. I’m planning a follow-up post describing the winning project in more detail. Voted for number 1, since I just think that spinal rhythms and muscle coordination are a good thing to study and learn more about. Maybe someday we can have a good theory why some people can jump higher from one leg while others can using both. Thanks for voting and for your feedback, John! Project 1 sounds like an excellent opportunity for a Letter to a top journal that’s had recent material on the importance of studying locomotor patterns for progress on human diseases like those you mentioned. It sounds important to me (and obviously to you). I remember doing a helluva lot of work on cigarette smoking & “body image” when no one wanted to hear the suggestion that women might curb their smoking if they knew it would make them “wrinkled & ugly”. No journals wanted to know but it became a letter cited by many, later. Worked for us! Thank you for voting and for your feedback! It’s interesting you mention that your letter was later cited by many. I recently heard the same from someone working in motor control. He published full-length articles in more well-known journals, and yet his letter continues to have the most citations. There’s a lot of debate these days about what constitutes a publishable unit. I believe smaller publications can have great value.